"On 30th July 1816 four members of the Riddiford family of Thornbury were committed to Gloucester Gaol. They were Abraham Riddiford aged 71, his wife, Dinah aged 69 and their sons, Luke and Aaron. All four were charged with breaking into the home of Daniel Reed in Thornbury. Daniel lived in the property which had formerly been known as The Seven Stars and later became known as 21 Rock Street. Two sides of bacon, two pigs cheeks, a tongue piece, two sweet bones, about 30 lbs of salt butter in an earthen pan and a copper kettle had been stolen. The total value of the goods was estimated to be worth £4. The trial took place at the Summer Assizes 1816 which we understand were the first to take place in the courtrooms at the newly built Shire Hall. We don’t know any details of the evidence presented at the court nor the Riddiford’s defence. It is surprising that Dinah and son Luke was condemned to death by hanging, whilst her husband, Abraham and son, Aaron were acquitted. Luke’s sentence was later commuted to transportation for life, but Dinah received no reprieve. The Capital Punishment website says that Dinah was probably the oldest woman to have been hanged in England in the 19th or 20th Centuries. 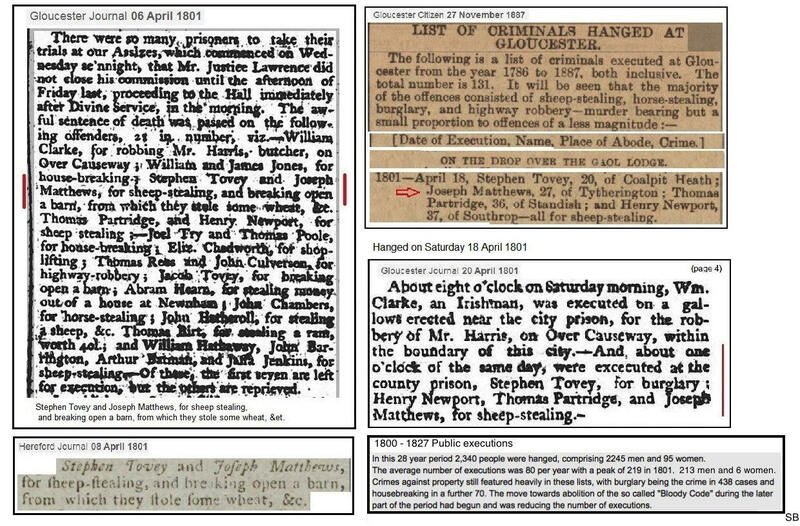 Seventeen death sentences were passed at the Gloucester Assizes of August 1816 but only Dinah and one other person were hanged. The excellent book ‘Hanged at Gloucester’ by Jill Evans includes the following extracts from the journal written by the prison chaplain about his visits to Dinah. ‘On 24th August he wrote that Dinah solemnly declared her innocence and said that her own husband had sworn away her life. Two days later he reported ‘She denied the offence for which is condemned with so much earnestness, that I was almost led to believe her innocent, but on examining her son, Luke Riddiford, who appears to give me a true account of the transaction, I am now convinced that her guilt is established beyond doubt. The next day, the chaplain told her that there was no hope of an appeal being made to save her life. After that, she became calmer, and on 5 September, two days before her execution, she finally admitted that she had taken some part in the crime for which she was condemned, but the chaplain reported that it was with the greatest difficulty that he had got her to make this admission. On 6 September she made a full confession, and on the next day she went to the scaffold‘. The event became known as ‘The Granny Hanging’. 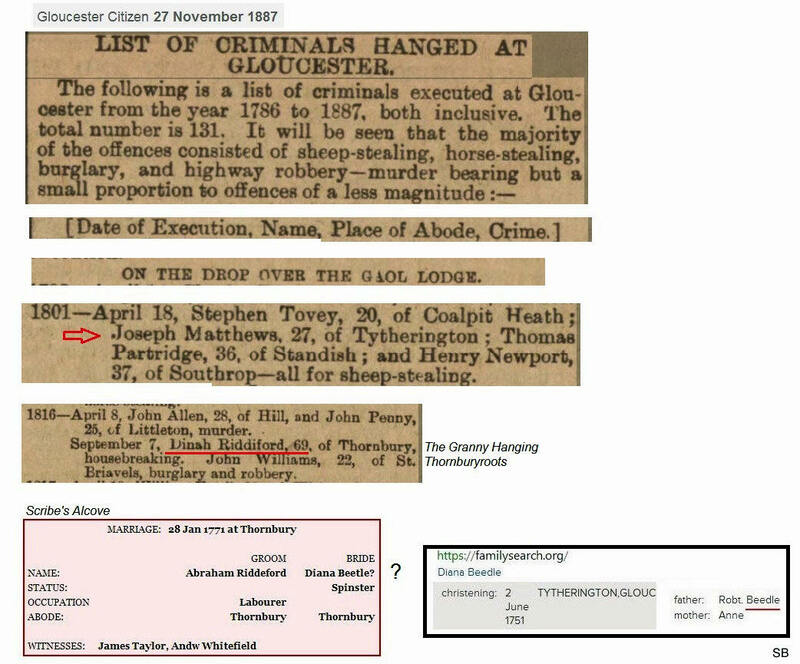 By tradition those who had been hanged at Gloucester were buried at the gaol and it is believed that there could be as many as 122 bodies there. For this reason it is interesting to read that Dinah’s body was returned to Thornbury. This is confirmed by the parish records of St Mary’s Church which show that Dinah was buried there on 10th September 1816 aged 68. She was the third executed criminal to be buried there in 1816. The other two were John Allen and John Penny who had been involved in the Poaching Affray. Luke’s sentence was commuted to transportation for life and in December 1816 he was sent to a prison hulk called the ‘Justitia’ that lay at Woolwich. On 11th April 1817 he and 219 others sailed on a prison ship called ‘Lord Eldon’ which arrived in Port Jackson, Sydney on 30th September 1817. There were 220 male convicts on the ship leaving the UK guarded by 30 men of the 46th Regiment. It sailed via Rio de Janeiro and arrived in Sydney with 215 of the men in good health. The official convict records show that Luke was aged 34, his trade was a ‘waterman’ and that he was 5ft 6 1/2 inches with black hair and brown eyes. A Sydney newspaper article of December 6th 1817, only a few months after his arrival, suggests that Luke had quickly made himself scarce. It listed him amongst a large number of men who had ‘absented themselves from their respective employments.’ Some of the men even had false certificates. Apparently every effort was to be made to catch them all. We don’t know how long Luke was on the run. The authorities were still listing ‘Luke Ruddiford’ as an escaped convict in the newspapers in March 1818. Our next knowledge of him comes from the Hobart Town Gazette and Van Dieman’s Land Advertiser published on 18th August 1821. Under the name of ‘Luke Ruddiford’ he and another man were charged with robbing a man in Hobart and assaulting him. They were found guilty and sentenced to receive 100 lashes to be transported to ‘such place as His Honor may think proper‘ and in the meantime to work in the gaol gang. Papers of the Colonial Secretary’s Office dated 21st October 1821 and 22nd October 1821 show that ‘Luke Ruddiford’ was listed amongst a group of 32 men who were transferred from Hobart on the ship Jane and received into Sydney Gaol. The gaol papers confirm that Luke Ruddiford was the same Luke Riddiford who arrived on the Lord Eldon in 1817. On 1st November 1821 he was being moved again. This time he was listed as a prisoner transported on the ship ‘Sally’ sailing to Newcastle. He stayed here until 25th September 1823 when he sailed from Newcastle to Port Macquerie on the ship Elizabeth Henrietta. A record dated 1822 indicates he was sent to work in the employment of the government at Port Macquarie. He may have been working for the government but this was no civil service posting. Port Macquarie was a penal colony formed specifically for receiving convicts where they were forced to build the place that would become their gaol. Conditions were unpleasant and its remoteness made it unlikely that the prisoners could escape. It appears that Luke didn’t live a long life. He seems to be the person named ‘Luke Readyfoot’ listed in Australian Burial Indexes. He died in Port Macquarie in 1825. We have had difficulty in making a link between this branch of the Riddiford family and other branches known to have lived in the Thornbury area. When Abraham Riddiford was buried on 2nd June 1820 he was said to be aged 75 and living then in Oldbury. This means that he was born about 1745. We cannot be sure about Abraham’s parents and do not wish to speculate. Scribes Alcove has a record of the marriage of ‘Abraham Riddeford and Diana Beetle’ in Thornbury on 28th January 1771 which we believe to be the correct date. This shows Abraham was a labourer. Both Abraham and Diana were living in Thornbury at the time of the marriage. Abraham continued to live in Thornbury until he died in 1820 aged 75. According to Jill Evan’s book he met an unpleasant death. An inquest at Thornbury on 1 June 1820 found that Abraham was killed on the spot after severing an artery while climbing over a pike gate. He joined his wife in Thornbury churchyard. Diana (or Dinah) – appears to have had several children whilst still a single woman. According to the IGI Maria was born on 9th November 1800, Susanna as born on 28th May 1805 and Ann was born on 21st August 1806. All three were baptised on 14th January 1810." Recent research has indicated that a descendant of Diana is the celebrity Kyle Minogue.